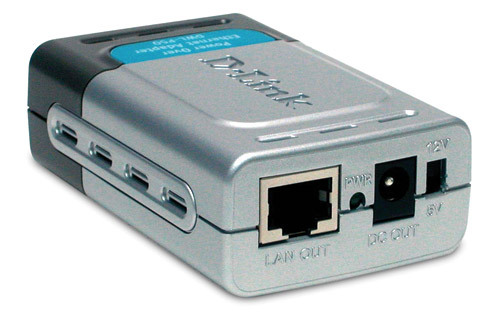 Also known as: remote server environment monitoring, computer room monitor, data center thermometer, temperature humidity IP sensor, computer room temperature alert. Server monitoring system is designed for 19-inch rack mounting, the height is one rack unit - 1U. Rack-mount monitors are very convenient for cabinets. The Hx531R monitor can be fitted into a rack "zero U" because of its thin design. It can fit behind other equipment taking up space that is otherwise unusable. Model H4531R is prepared for connection of external Pt1000 temperature probe and models H3531R, H7534R are equipped with 1 meter temperature + humidity probe. Unit also contains three binary inputs for detection of two-state events - e.g. power presence, water, smoke, airflow, glass break detection, door contact. 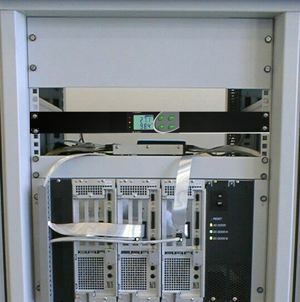 Rack unit provides 5Vdc and 12dc power supply for external all sensors and detectors. Large dual line LCD for simultaneous display of temperature, humidity is an advantage. Parameters are easy adjustable from transmitter keyboard or from the computer. State-of-the-art capacitive polymer sensor ensures excellent calibration long term stability, inertia against water and condensation. Environmental monitor is equipped with two relay outputs for alarm indication or control of external devices. Each relay can be assigned to any measured value. 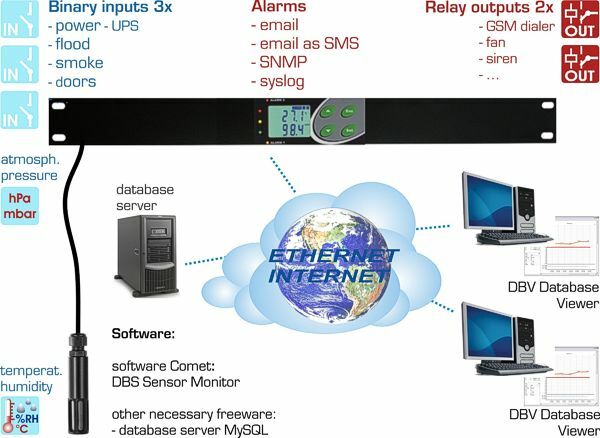 Easy creation of online data acquisition system from several rack monitors by using new low cost database software Comet DBS Sensor Monitor - see also Accessories. Modbus TCP: Modbus TCP protocol enables to read measured values and binary input states, set alarm limits, adjust the probe. Telnet: Port 9999 enables to set alarm limits (lower, upper limits, hysteresis for measured values and time delay), e-mail addresses, SNMP addresses, probe description, refresh of www pages (10s to 65535s), set storing interval to history (10s to 65535s), enable each communication channel. Capacity of the history memory is 100 sets of temperature, humidity, pressure + computed values. Password protection of this port is enabled. Automatic IP address assignment from DHCP server is also enabled. WWW pages: User selectable design of www pages enabling to display curve of measurement history and binary input states. 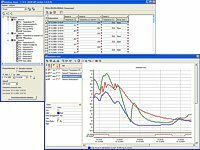 User can design the look of www pages and temperature, humidity, pressure + computed values history. SNMP: It is possible to read actual values, alarm limits and binary input states. In case of alarm creation warning message (trap) is sent to addresses defined by the user (maximum three addresses). Online transmitter enables to monitor measured values and binary input states. In case of exceeding of adjusted limits warning message can be sent to specified addresses. E-mail: In case of alarm creation warning e-mail message is sent to addresses defined by the user (maximum three addresses) or via e-mail to SMS message. Basic SMTP autentization is supported. SNMP: In case of exceeding of adjusted temperature, humidity, pressure + computed value limits or binary input states alarm is activated and warning trap is sent to user specified IP addresses (maximum 3 addresses). WWW pages: In case of exceeding of adjusted temperature, humidity, pressure + computed value limits or binary input states active alarm is displayed on www page. Synchronizing of time and record to www table and measured values history is enabled by SNTP via Internet. Signal for binary inputs: from voltage-less contact, open collector or two-state voltage signal. Power: 12 Vdc, maximum consumption 250mA. relative humidity 0 to 100% Thermometer-hygrometer. Included T+RH probe with 1m cable. Cable lengths 2m or 4m available optionally. Humidity values available also as dew-point temperature, absolute humidity, specific humidity, mixing ratio, specific enthalpy. accuracy: +/-1,3hPa at 23�C Thermometer-hygrometer-barometer. hPa, kPa, mbar, mmHg, inHg, inH2O, PSI, oz/in^2. Barometer enables to measure sea level pressure by setting of correction to altitude above sea level. 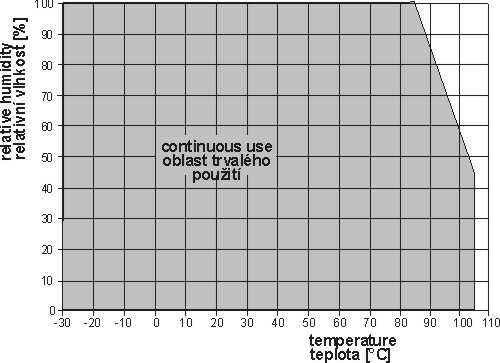 * Relative humidity at temperature over +85�C is limited in accordance with the graph. Near plastic case with electronics and probe cable maximum temperature is +80�C. Set of four rack mounting screws is also included. SensorReader - freeware for online logging values from one transmitter to a PC disk file is ready to download. Program enables to alarm acoustically the PC user if adjusted alarm limits are exceeded. Recorded values in CSV format are easy to process in e.g. Excel. Program can be started several times on a computer at the same time to monitor values from several transmitters. SP008 AC voltage presence sensor, connectable to binary Hx531 inputs. LD12 Water leakage detector, two-state output, connectable to binary Hx531R inputs. Powered from Hx531R 12Vdc output. SD280 Optical smoke detector, relay output, connectable to binary Hx531 inputs, powered from Hx531R 12Vdc output. 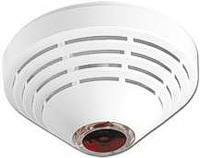 The SD280 detector combines an optical smoke sensor with a heat sensor. Both sensors have their outgoing signals processed digitally, resulting in higher false alarm immunity. JS20 P.I.R. motion detector is for interior protection. It detects object movement having a human body temperature. The JS-20 distinguishes itself with excellent RF immunity. The signal from the sensor is electronically analyzed. This ensures that the detector provides excellent sensitivity and false alarms are basically eliminated. The detection analysis rate can be adjusted to increase its immunity if the JS20 is installed in a problem location. It can be mounted on a flat wall or in a corner. Connectable to binary Hx531R inputs, powered from Hx531R 12Vdc output. SA200A Magnetic door contact, connectable to binary Hx531 inputs, without cable. 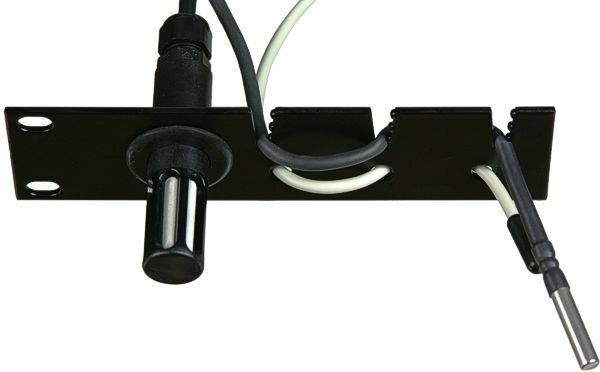 Magnetic door contact, connectable to binary Hx531 inputs with cable lengths 2, 5, 10, 20, 30 meters. PP90 right-angled stain-less steel flange for wall mounting. SP006 Tool for easy wire connection to terminals. 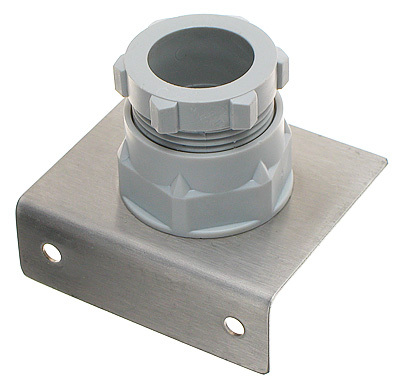 accessory for calibration and adjustment of humidity by the user. Software and firmware for transmitters. You can downlaod configuration programs and updated firmware from page Download - transmitters and transducers.